OBUKHOVSKAYA INDUSTRIAL COMPANY Ltd produces and starts up, crushing & sorting plants, producing cubiform gravel (macadam), as well as slag crushing and separating aggregates. In order to produce cubiform gravel from heavy mined ore OBUKHOVSKAYA INDUSTRIAL COMPANY Ltd manufactures its own Crusher DIM 800K, patented in Russian Federation. Offering undisputed advantages, the DIM 800K is beyond compare by its original way of crushing all over the world. An innovative crushing method consists in applying series of crushing impacts. The DIM 800K is highly demanded in industries as: road construction (high quality cubiform macadam, components for asphalt production), of construction materials production (concrete, reinforced concrete), mining (ore grinding). The DIM 800K recycles any heavy lumps of ore or abrasive ore into crushed stone, graded sand, or sorted crumb. The crusher DIM 800K shapes cubiform gravels at output. The grains’ strength is increased due to bumping the weakest areas and to crushing the stones by internal cracks. Structurally fit for heavy lump rock sizes, the DIM 800K is able to treat any lump rock sizes up to 400mm, which moisture is of 12%. The crusher’s performance is 120 t/hour after full loading. The crusher DIM 800K has a high grinding ratio— up to 1:200. Crushers DIM 800K are equipped with a heavy capacity engines (55 or 75 kWt).This means the lower power consumption, if compared with whatever crushers of an equal performance and functionality. High is the output of cubiform gravel: up to 95%. Crushed by DIM 800K, gravel fits the Limagnole parameters of GOST 8267-93, group One. This grade is sanctioned to be used on Federal high ways. Undisputed is advantage of crusher DIM 800K in producing materials for covering highway pavements. The crusher outputs an attractive range of small fractions (3-5 mm, 5-10 mm, 10-15 mm) of crushed cubiform gravel. While granite processing, the output of most used fractions reach following volumes: 40% - for 5-20mm and 50% - for 20-40mm fractions. While processing of sandstone (quartz) the output of most used fractions reach following volumes: 35% - 5-20mm, 35%—20-40mm, 22%— 40-60mm fractions. While processing of sand-gravel mixtures (river stone) the output of most used fractions reach following volumes: 45% — 5-20mm, of 21% — 20-40mm fractions. In just a few minutes the crusher is easily reconfigured to produce an end product of required fraction. The crusher has multivariate schemes settings of crushing regimes. The crusher could be reset to grinding function only to produce mineral powder (used in asphalt industry), dry mixes of marble, limestone, gypsum, dolomite powder (additives needed in agriculture, and glass production). Crusher is also used in mining industries for ore grinding. Crusher DIM 800K is aggregated: no need for any foundation. The machine is supported on a steel frame base structure with service platforms. OBUKHOVSKAYA INDUSTRIAL COMPANY Ltd authors, designs and produces semi-mobile crushing and screening systems (DMS-90, DMS-200, DMS-300) for the production of cubiform-shaped gravel (crushed stone). Crushing and screening systems are fully aggregated. As they are supported by metallic framed structures, there is no need for any delivered aggregate to be installed on the foundation. Unique and beyond compare is a MPR-1500 CRUSHER machine, designed at OBUKHOVSKAYA INDUSTRIAL COMPANY Ltd for large-sized concrete structures. Without any pre- operation, MPR-1500 CRUSHER machine processes slabs, dimensioned 12000х1500х600 mm. Concrete plates or any other construction wastes are pushed on the table to be pressed. Once concrete slab crushed, the rebar is moved to the output. The stones crushed go through the output trays toward the conveyer and are shipped for further processing. 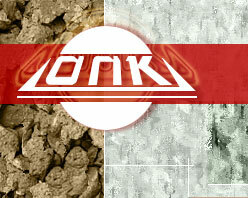 OBUKHOVSKAYA INDUSTRIAL COMPANY Ltd has authored, designed and manufactured concrete scrap recycling plants. The plant’s technological chain is made of a MPR-1500crusher, crushing and sorting aggregates and of a system of conveyors. It is designed to process non-standard reinforced concrete. rocesses slabs, dimensioned 12000х1500х600 mm. The MPR-1500 is used for an initial concrete products demolition. On this stage the metal fixtures are separated from concrete. Then the concrete crushed in pieces are forwarded by conveyer onto the crusher to be recrushed. After that the small pieces are screened into gravel and sand. The plant’s performance generally depends on processed composition and technological configuration of the plant and reaches up to 50m3/h. The company's engineers are working out the technology scheme of equipment chain configuration with reference to your place. Scrap recycling plants are highly reliable and have significant operation resource. Plants configuration is modular. This configuration method means faster commissioning. The equipment is made of most reliable and technologically advanced components and best grades of steel. A single shield of plant’s start-up is remotely controlled. Each aggregate in technological chain is fully automated. (с) Obukhovskaya Industrial Company, Nizhniy Novgorod, 2010-2019.